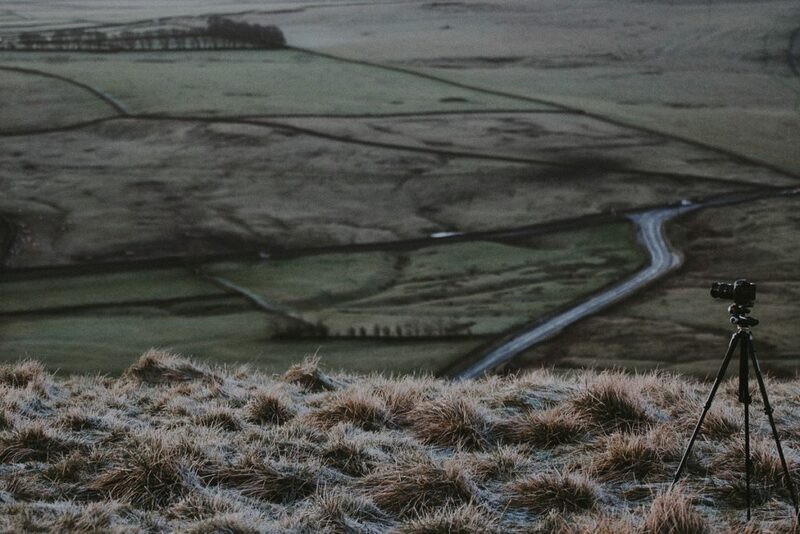 If you’re serious about taking great photos, then it’s essential to own a tripod. Whether you’re going on a trip or just taking some family photos, you don’t want to end up with fuzzy images from a shaking hand. A tripod gives you the added ability to achieve angles and impressive close-ups that you couldn’t obtain otherwise. 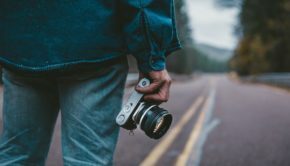 There are a lot of camera tripods to choose from, so in addition to considering your degree of professionalism and budget, consider the durability of the tripod, its versatility, and its portability. To ensure a long life for your new tripod, consider how much weight it will need to bear. Professional cameras can be especially heavy. Are the tripod parts made solidly, and are the extensions built for repeated extension and collapse? 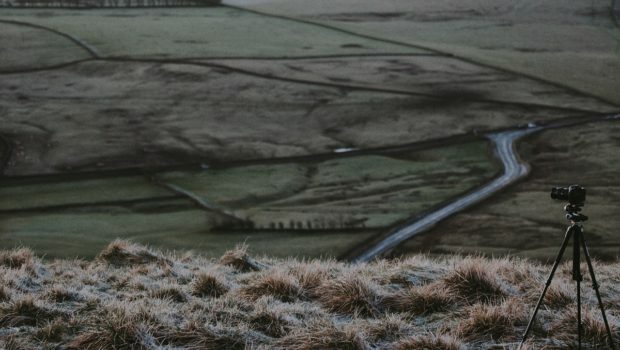 Are there reliable and durable locking mechanisms on the legs so you can extend and keep them at the height you need in order to achieve your photo? Make sure that your tripod can handle whatever tasks you throw at it. The camera tripod that you select should serve a variety of your needs. You’ll want a stable ball head or platform that will enable you to angle and rotate your camera to get your desired shot. Can the mounted camera be easily turned and angled? Is the movement smooth? If you’re taking photos from a variety of angles, you’ll want a tripod that can be set up and taken down quickly with ease. Determine how the weight and durability of your tripod balances with the desired portability. 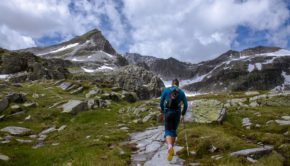 If you plan on carrying the tripod for any real distance, this is an especially important consideration. Purchases that include a carry case are a nice bonus. 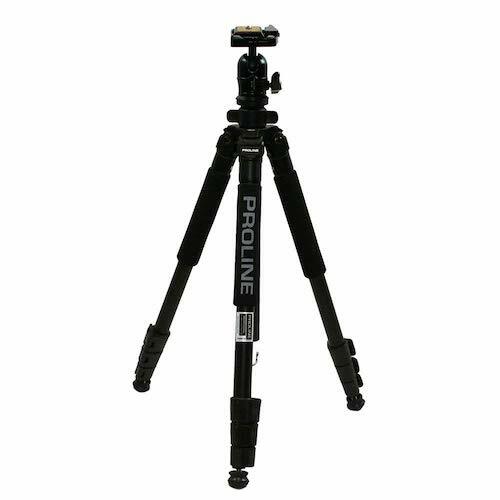 This durable tripod is built with 5-section 23mm aluminum alloy legs. With three different leg angle options, this tripod has feet that can convert from rubber to spiked. 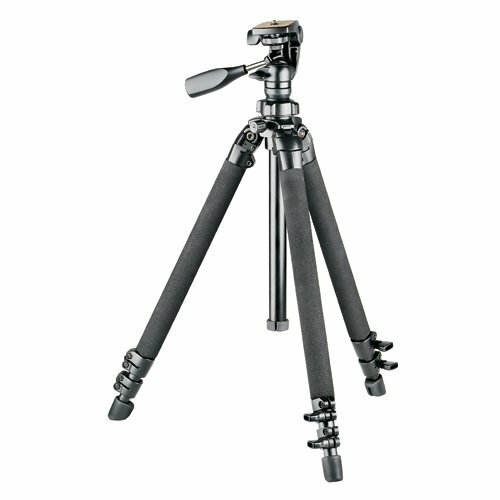 Additionally, this tripod features strong stainless steel quick flip leg locks with adjustable tension. It provides a high-load performance, with a maximum load of 13.2 pounds. You’ll enjoy the multi-action ball head and soft rubber handle that makes the use of this tripod a breeze. Store everything away safely in the included carrying case. One reviewer mentions that while this tripod may be a bit heavier than other options on the market, it’s well-built and folds up into a compact size easily. Another reviewer mentions that the flip locks are easy to use, making the transition from one angle to another easier. If you want a very lightweight and highly portable tripod, this may be the one for you. At only 1 pound, it’s as durable and professional as it is light and compact. 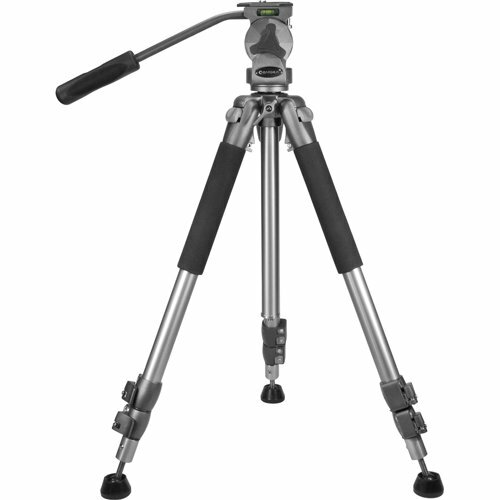 This tripod extends to a 66-inch height and has a two-way fluid head. This option features a quick release platform, along with extendable legs and rubber feet. With a weight capacity of 8.8 pounds, this tripod is ideal for carrying around as you take photos. One reviewer wanted to mention that this tripod doesn’t allow for left and right tilt, but it’s high quality and sturdy. 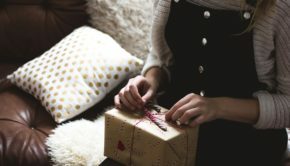 Another reviewer with 42 years of photography experience said that this option can rival the $300-400 professional options that are available. 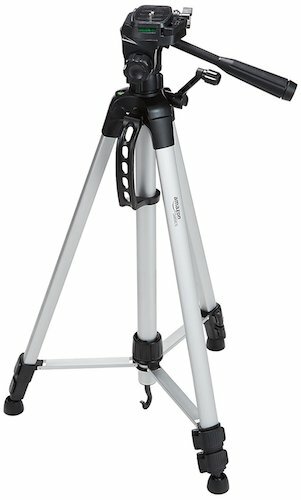 This full-size tripod provides a maximum height of 63 inches and features durable aluminum legs. The legs are individually adjustable to different heights and angles. The three legs are padded to add comfort in extreme hot or cold conditions. This tripod offers a three-way pan/tilt head with a large mounting platform, along with a slicing center column that is adjustable from 18-61 inches. You’ve got flexibility here! One reviewer mentioned that this tripod isn’t very portable, but it is sturdy and won’t be easily knocked down. It will easily support heavier cameras. 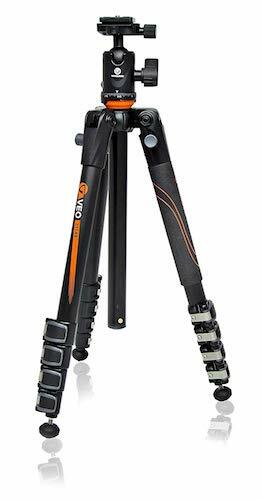 This tripod offers a 62-inch aluminum construction that can support up to 13 pounds. It features quick release leg locks and non-slip rubber feet for great stability. Most important, it has a secure ball head with a quick release plate and bubble level. All these features come at an economical price too! One reviewer mentions that the legs deploy, lock, and adjust quickly and smoothly. There is a hook included to hang a stabilizing weight. This less-expensive tripod offers great features for many photographic uses. It’s lightweight at only 3 pounds and extends to 60 inches. A quick-release mounting plate helps ensure fast transitions between shots. Two built-in bubble-view levels and a three-way head provide acceptable flexibility for swivel motion and portrait or landscape use. This purchase includes a handy carrying case. One reviewer mentions that the tripod is strong and stable, supporting a standard camera with ease. Another reviewer says that the tripod can be set up and taken down quickly, and when the locks are tightened, the tripod is very secure.